Members of the Legislature will join dozens of CALSTART representatives and executives of tech and government organizations — including the California Air Resources Board, the electric car company Tesla, the United States Environmental Protection Agency, the ridesharing company Uber, Sacramento city officials, and the governor’s office — to brainstorm problems and solutions to the ambitious green goals. Yesterday state Senators Nancy Skinner, D-Berkeley, and Connie Levya, D-Chino, joined Assemblywoman Eloise Gómez Reyes, D-Grand Terrace, to introduce a package of bills that are “designed to support and drive investment into innovative clean vehicle technologies that support local jobs and fleets, while also accelerating the adoption of vehicles that help clean up our air,” said John Boesel, president and CEO of CALSTART. More than a third of chronically homeless people in the United States live in California, according to the state’s housing department. A new report from a Los Angeles nonprofit seeks to identify people at risk of becoming persistently homeless before they fall into that cycle. The research coming out today from Economic Roundtable includes screening tools to predict who has the greatest risk of becoming chronically homeless. It looks specifically at young adults and people who have lost their jobs. Economic Roundtable President Daniel Flaming says he hopes the tools will encourage the government and community organizations to help to people when they first become homeless or before they lose their homes. Right now, he said, homeless aid largely goes to people who have already been homeless for a long time, when it’s harder and more expensive to help them get back on their feet. “The idea of these tools is to identify people at high risk very early and give them substantial help, but help that’s a lot cheaper,” Flaming said. Nearly 100 #Health4All coalition advocates are rallying support for Senate Bill 29 today, ahead of the Senate Health Committee hearing on the proposal at 1:30 p.m. Sen. Maria Elena Durazo’s measure expands Medi-Cal access to all income-eligible adults, regardless of immigration status. 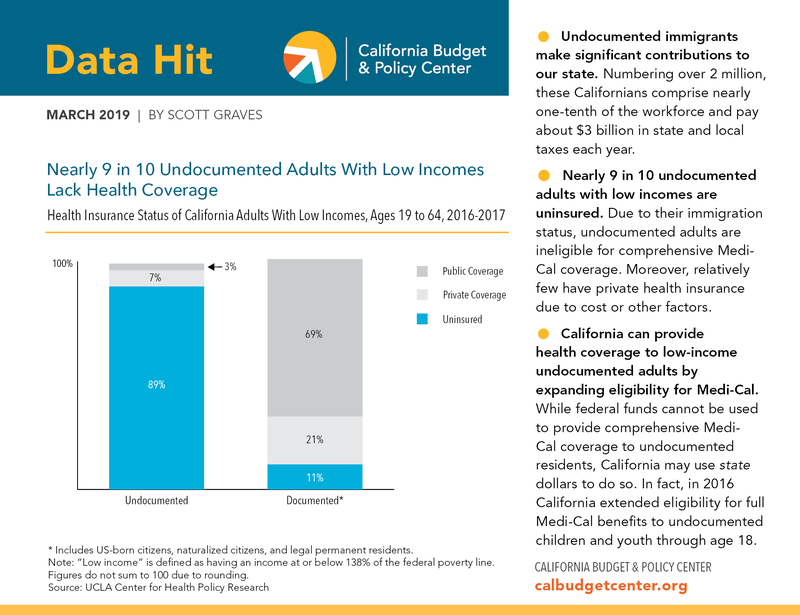 The hearing comes a day after the California Budget & Policy Center announced that nearly nine in 10 undocumented working adults don’t have health insurance. There are more than 2 million undocumented immigrants in California and they pay about $3 billion in local and state taxes each year, the center reported. Advocates will join the Los Angeles Democrat, health and immigrant rights policy experts and individuals who will share their impact stories. For your radar — Gov. Gavin Newsom is meeting with California’s Big City mayors today to hear how the local leaders, including Sacramento Mayor Darrell Steinberg, have used Homeless Emergency Assistance Program funds. Assemblyman and longtime advocate for homelessness solutions Phil Ting, D-San Francisco, will join the meeting, scheduled for 10:30 a.m. at the governor’s office in the Capitol. And tonight Equality California will honor Insurance Commissioner Ricardo Lara, Newsom Cabinet Secretary Ana Matosantos and Former Board President Mandy Lee at the 2019 Sacramento Equality Awards. The 400-guest event begins at 5:30 p.m. at the Golden 1 Center and celebrations include drag queen performances, a Sacramento Kings drumline and the awards ceremony.